My brother and sister and I share caregiving responsibilities for mom. People say “that’s wonderful,” but it doesn’t always work out that way. We often have different opinions on what kind of help she needs and then we argue for weeks while mom waits for help. None of us wants to take over all her caregiving needs, but we all love her and want a way to work together for her benefit. Your mother is lucky to have three children who love her and want to remain involved in her care. Family Meetings can help you learn to work together and make it easier for the three of you to identify your options and agree to move forward. The ground rules are: before the meeting each participant receives a list of topics for discussion. During the meeting, everyone has the same amount of time to present his/her views while the others listen without interruption. A time-limited group discussion follows. Then you vote and the majority rules. 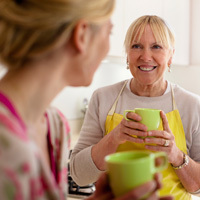 Log on to www.eldercareteam.com/resources/articles/familymeeting for more information and guidelines for a successful family meeting. Dual Caregiving: Who's in Control?